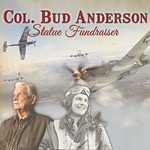 (Auburn, CA) Bud Anderson, a World War 2 pilot and American hero, served two combat tours, escorting heavy bombers over Europe, and the City of Auburn, along with other community volunteers, is working to honor his service. “Thanks to the work of Douglas Van Howd, a local artist, a life size statue has been created, depicting Col. Anderson and his famous P-51 Mustang. TGH Aviation continues to work with the Auburn Airport Business Park Association, the Auburn Area Chamber of Commerce and The City of Auburn, along with many others, to fund the completion and placement of the statue at the Auburn Airport,” Richard Anderson of TGH Aviation explains. TGH Aviation, in an effort to see the statue properly placed, set up a fundraising website designed to allow others to contribute to this great cause. “Bud Anderson exemplifies everything that is great about America and the goal is to ensure this statue is placed in the very near future. Although the city of Auburn has graciously arranged for leasing of the property for the statue, along with paying for the electrical lighting elements and base of Mr. Anderson’s monument, more needs to be done,” Anderson continues. The recent fundraising event, sponsored by TGH Aviation, helped move the project forward and the same is true of the $10,000 received from the Auburn City Council, which approved funds from the Airport Enterprise Fund. “More money needs to be raised and the hope is that the exposure received from the fundraising event and other activities will draw more attention to this project. Bud Anderson is an amazing man, one who served this country as part of the 357th fighter group know as the Yoxford Boys. This group has been credited with shooting down more aircraft in a shorter period of time than any other during the war,” Anderson goes on to say. Bud Anderson continues to fly, even though he is now 91 years of age. Not only has he been inducted into the National Aviation Hall of Fame, his story has been shown on the History Channel as well as the Military Channel. “America needs more heroes like Bud Anderson and this statue will bring more attention to the great things this gentleman has done. He deserves nothing less than the best and we plan to give him exactly that with the monument being created. Any donation is appreciated,” Anderson declares. TGH Aviation started as a general aviation gyro repair shop fifty five years ago and has since expanded to offer sales and repair of a full range of aircraft instruments. Thanks to a rigorous quality control program and full time quality control manager, the shop meets or exceeds all industry standards for technical excellence. A veteran-owned company, TGH employs forward-thinking, growth-oriented management and all employees work to build the company reputation while improving industry presence and stature. The mission of TGH continue to be to provide customers with high quality products, overhauls and repairs, all delivered with premiere customer service.